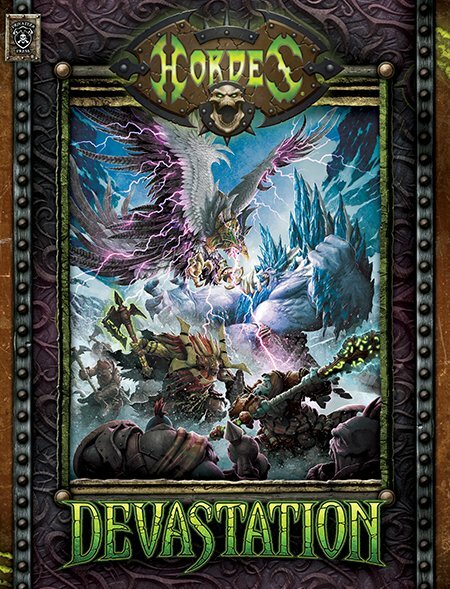 Trevy the Great here again from Way of the Swan with another awesome Devastation review – It’s Minions Time! Last but not least in our coverage of the Devastation releases we get to the humble denizens of Blindwater and Thornfall and the reinforcements from the new Hordes expansion streaming out of their holds to bolster the beleaguered of the other four Factions! What’s up folks!? It’s Trevy the Great here again from Way of the Swan with another awesome Devastation review! As with my other reviews, I’m not going to get into specific rules of individual releases, just my impressions of the release overall as it relates to the rest of the meta. This time we’ll safari into the dank swamps and dry plains of the Iron Kingdoms to study the new Minions releases in the most recent Hordes expansion. Unlike the other ‘main’ Factions, Minions didn’t receive any new Warlocks in Devastation; but made up for it with a host of new Warbeast releases that have wide-ranging implications! First up we have the Blindwalker, a new Gatorman Warbeast chillin’ in a modular kit with the Blackhide Wrastler. This guy is a big deal for the Pact for a bunch of reasons, not the least being his low cost, massive survivability and added layer of ranged denial. At MAT 5, Fury 3 and P+S 14 he won’t be dealing any damage, but his poor attack values aren’t the reason he’s there. With his Animus active, a Blindwater Warlock can channel through the Blindwalker as if it were an arc node, at the cost of a couple Fury and D3 damage per spell. This alone puts a heavily disparaged Warlock; Calaban the Gravewalker back on the map, allowing him to safely channel Parasite and Boneshaker while staying out of danger, potentially keeping the Blindwalker safe with Occultation at the same time. With Blindwater’s recent releases giving them an incredibly powerful gunline, the addition of an armor debuff to the mix can see Croak Raiders and Sacral Vaults taking the likes of Colossals off the table; all from 10-12 inches away. The Blindwalker might also see some play with Rask or Jaga Jaga, where its survivability and the added utility of swapping buffs such as Fury or Ghost Walk from a long distance lets those Warlocks affect the battlefield from safety. Next up are two Warbeasts, which I’m going to stack together because they basically make up one big release; the Splatter Boar and Battle Boar. Both of these little piggies work for the Thornfall Alliance Pact and both are outstanding in their own right, but taken together and they are more than the sum of their parts. The Splatter Boar is combination medium-range artillery piece and buff bot; great at killing infantry wholesale or dinging up heavies if they can hit them through their inaccuracy. With the current massive prevalence of Legion, Acidic Touch is important for its corrosion immunity alone and the powerful damage buff is just icing on the cake! Between an outstanding Animus and a super cool gun, this guy will be a staple in Thornfall list regardless of the Warlock. Hand-in-hand with the Splatter Boar comes the fearsome Battle Boar! This fellow is a little less nuanced and Faction-changing as his alchemical cousin, but still powerful in his own right. Instead of adding a toolbox of ranged attacks and buffing abilities, the Battle Boar almost replaces Thornfall’s unexciting heavy Warbeasts. While its damage output per point isn’t quite as impressive, as that of a War Hog especially versus super high ARM stats, the Battle Boar makes up for that in numbers and an impressive speed. When buffs like Hog Heaven or Acidic Touch are applied, the greater number of attacks thrown by Battle Boars can start taking heavies or Colossals off the board with ease. While Splatter Boars are likely going to see play in almost every Thornfall list, these little guys are going to need a more specialized list to shine. Fortunately for them; most Thornfall Warlocks bring strong battlegroup buffs that help them out; Carver is the most obvious, but Arkadius, Helga and Midas are all strong considerations as well. These two lights have spawned a new list that’s making the rounds of theorymachine dojos around the world. In the storied tradition of the late EE and Meat Mountain, “Hamspam” involves 9 Battle Boars and 4 Splatter Boars led by Lord Carver. The list is pretty straightforward; it stacks tons of armor and hitpoints and can crack heavy armor between Acidic Touch and Hog Heaven at surprising speeds due to Mobility and the Battle Boar’s Rabid. It can also deal with infantry via sheer number of boosted attack rolls and deviating acid bombs. It list that will become a strong player in the scene once the little pigges come out to play. 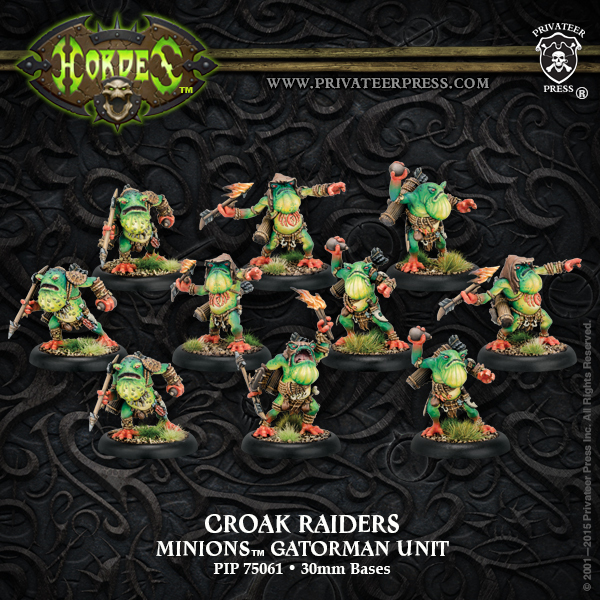 Continuing on the theme of meta-defining releases we’ll move on to the Croak Raiders, which have been perpetually sold out of all my local stores since their release over the summer. A solid all-rounder unit with decent MAT (w/ Gang) and RAT values to fight infantry and the internal synergy of Oil+fire attacks to beat up heavier targets. On top of solid defensive stats and AD, all for a reasonable point cost, Croak Raiders have already become a common sight in many Hordes lists; from Legion forces built around abusing Oil with multiple fire-typed attacks to Trollblood gunlines. In Minions, Croaks give Blindwater the strong ranged unit that they’ve been missing, which does wonders for some of the lesser used Warlocks such as Barnabus and Jaga-Jaga. 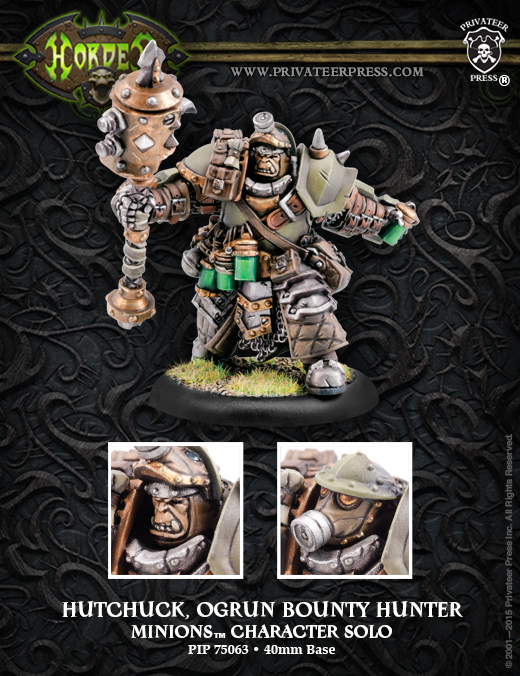 Combined with the Sacral Vault and Ironback Spitter, Croaks complete the pact’s powerful gunline. At a reasonable cost for a strong ranged unit, Croak Raiders will see play in most other Hordes Factions as well. All-in-all, a strong release that will show up all over the place! 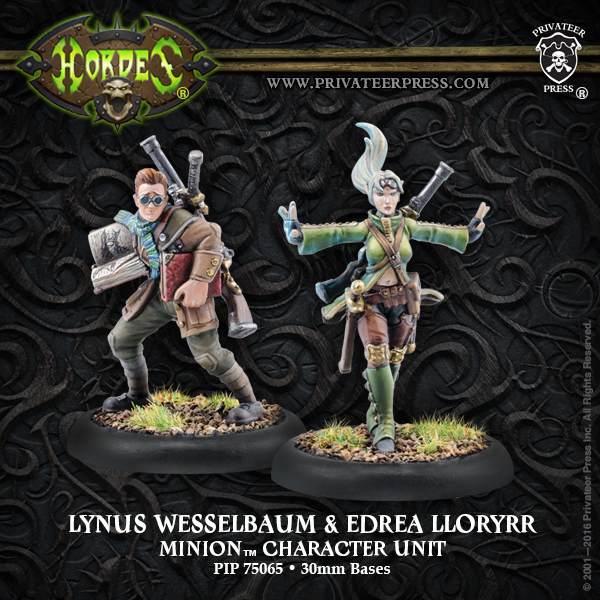 The second unit release for the Faction is less of a front-line skirmisher and more of a support piece; in fact, Lynus Wesselbaum & Edrea Lloryrr almost function more like a pair of support solos than a full blown combat piece. They work relatively independently; most turns Lynus will be boosting critical rolls with Collaboration while Edrea takes valuable True Sight Arcane Bolt and rifle shots. While they are a Minions release and work for several Hordes factions as well as both Minions pacts, this dynamic duo will see a lot of table time in Warmachine lists, where powerful solos that benefit from Collaboration abound. Boosting Gorman’s bombs, Eiryss’ crossbow or Aiyana’s Kiss are all powerful effects without many analogues among Hordes Factions. Still, boosting the occasional solo’s attack (especially important attacks such as Viktor’s bola or a Thrullg swing) or a magic attack roll from a Warlock focused on throwing out offensive spells (such as Grim2) are certainly useful tools, especially considering the weight of fire the unit brings to the table. Last on the list of Minions releases is a slightly less exciting solo; Hutchuck, Ogrun Bounty Hunter. Like Lynus and Edrea, this fellow fits into both Hordes and Warmachine lists where he can use Ambush to threaten back line support models. With a powerful melee attack, solid defensive stats and the ability to use all his attacks each activation (necessary to justify his hefty points cost), Hutchuck will be a terror in the backfield. Unfortunately, the big Ogrun obviously didn’t graduate alchemist school because he doesn’t bring the most useful bombs to the table and with a mediocre RAT value his ranged attacks won’t be particularly relevant aside from delivering incidental damage or the occasional dicing on a high-DEF target. At 3 points, it’ll be tough to squeeze this guy’s bulk into a list instead of important support models, but he’ll have a place in lists designed to fight Warjacks or need a flanking piece to keep the opponent honest. All in all, an exciting time to be a Hordes player! 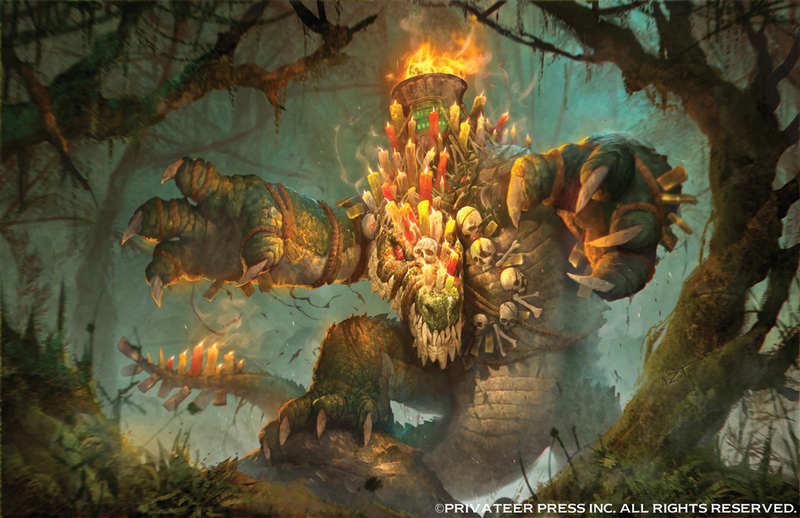 While Minions won out with lots of exciting, Faction-defining releases, options like Croak Raiders will be seen in plenty of lists across many Factions! Are you excited about any of the new Minions from Devastation? Are you planning on using any of them in your lists? Remember to check out Way of the Swan for more cool Warmachine/Hordes content!